The Missing Link superfood supplements close the nutritional gap between the natural diet and commercially processed pet foods. Veterinarian formulated, Missing Link supplements use only the best and most effective natural ingredients. 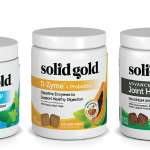 Discover wholefood nutritional supplements that support your pets’ health. 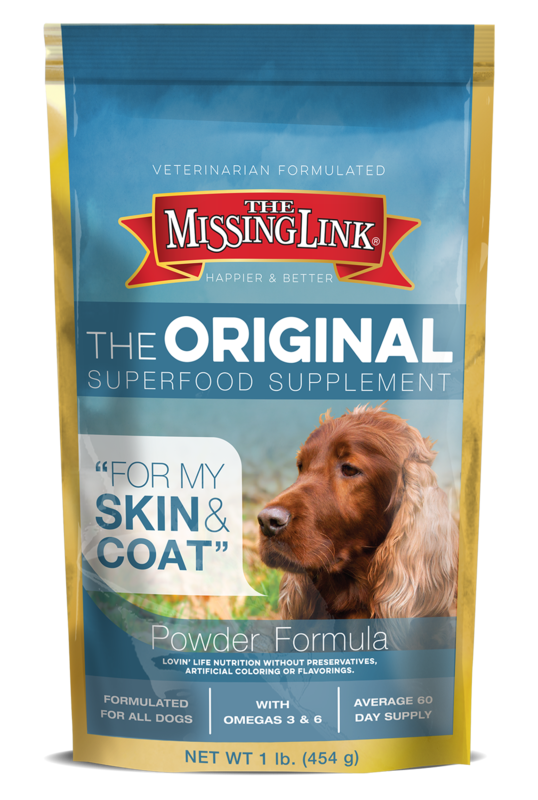 MISSING LINK SKIN & COAT is a daily food supplement that maintains your pet’s skin & coat health from the inside out. Providing essential nutrition that is not found or is limited in many processed foods including Omega 3 & 6 fatty acids, dietary fiber and phytonutrients. Each Missing Link recipe supports the immune system, boosts muscle & tendon function, sustains energy and promotes overall health & happiness. INGREDIENTS: Ground Flaxseed, Rice Bran, Primary Dried Yeast, Cane Molasses, Sunflower Seed, Freeze Dried Beef Liver, Dehydrated Alfalfa Meal, Dried Carrot, Ground Beef Bone, Dried Fish Solubles, Ground Barley Grass, Dried Kelp, Freeze Dried Oyster, Zinc Methionine Complex, Lecithin, Selenium Yeast, Niacin (Vitamin B3), Pyridoxine Hydrochloride (Vitamin B6), Garlic, Taurine, Yucca Schidigera Extract, Riboflavin (Vitamin B2), Thiamine Hydrochloride (Vitamin B1), Folic Acid, and Vitamin B12 Supplement. 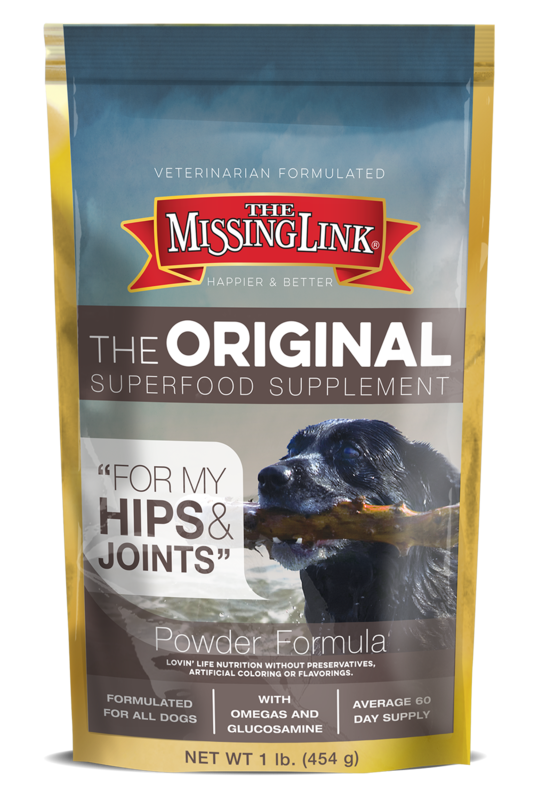 MISSING LINK HIP & JOINT has all the goodness of Missing Link Skin & Coat with the added benefits of joint & bone supporting glucosamine. Just like Skin & Coat it is a daily food supplement that maintains your pets health from the inside out. Providing essential nutrition that can’t be found in many processed foods including Omega 3 & 6 fatty acids, dietary fiber and phytonutrients. Each Missing Link recipe also supports the immune system, boosts muscle & tendon function, sustains energy and promotes overall health & happiness. 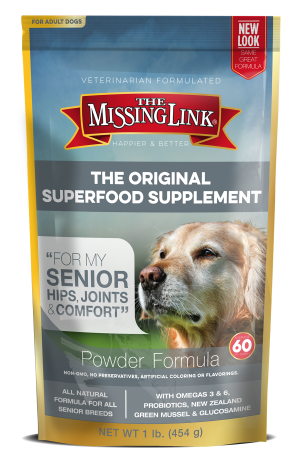 MISSING LINK SENIOR has all the goodness of Missing Link Skin & Coat with the added benefits of glucosamine, green lipped mussels and probiotics. Which provide additional joint support and pain relief in addition to promoting healthy digestion. Just like Skin & Coat Missing Link Senior is a daily food supplement that maintains health from the inside out. Providing essential nutrition that can’t be found in many processed foods including Omega 3 & 6 fatty acids, dietary fiber and phytonutrients. Each Missing Link recipe also supports the immune system, boosts muscle & tendon function, sustains energy and promotes overall health & happiness. INGREDIENTS: Ground Flaxseed, Glucosamine Hydrochloride, Freeze Dried Beef Liver, Green Lipped Mussel, Rice Bran, Primary Dried Yeast, Cane Molasses, Sunflower Seed, Dehydrated Alfalfa Meal, Dried Carrot, Ground Beef Bone, Dried Fish Solubles, Freeze Dried Oyster, Ground Barley Grass, Dried Kelp, Zinc Methionine Complex, Lecithin, Dried Lactobacillus Acidophilus Fermentation Product, Selenium Yeast, Dried Lactobacillus Rhamnosus Fermentation Product, Pyridoxine Hydrochloride (Vitamin B6), Niacin (Vitamin B3), Garlic, Taurine, Yucca Schidigera Extract, Riboflavin (Vitamin B2), Thiamine Hydrochloride (Vitamin B1), Folic Acid, and Vitamin B12 Supplement. 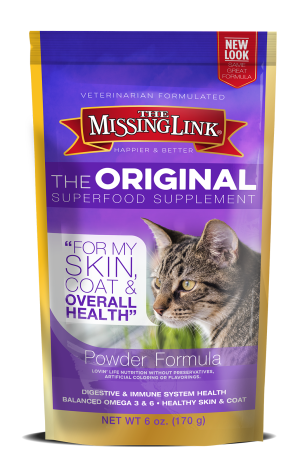 MISSING LINK FELINE is a daily food supplement with all the goodness of Missing Link Skin & Coat formulated and flavored for the fine tastes of your feline. It maintains your cats’s skin & coat health from the inside out. Providing essential nutrition that can’t be found in many processed foods including Omega 3 & 6 fatty acids, dietary fiber and phytonutrients. Which support the immune system, boost muscle & tendon function, sustain energy levels, weight and digestive harmony; promoting overall health & happiness. INGREDIENTS: Ground Flaxseed, Rice Bran, Primary Dried Yeast, Cane Molasses, Freeze Dried Beef Liver, Sunflower Seed, Dehydrated Alfalfa Meal, Dried Carrot, Ground Beef Bone, Dried Fish Solubles, Freeze Dried Oyster, Ground Barley Grass, Dried Kelp, Zinc Methionine Complex, Lecithin, Niacin (Vitamin B3), Pyridoxine Hydrochloride (Vitamin B6), Garlic, Taurine, Yucca Schidigera Extract, Riboflavin (Vitamin B2), Thiamine Hydrochloride (Vitamin B1), Folic Acid, and Vitamin B12 Supplement. 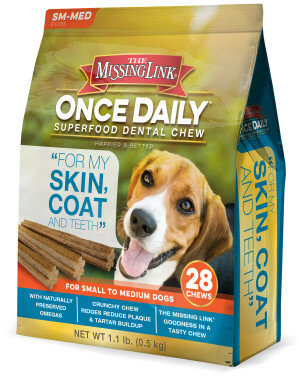 MISSING LINK ONCE DAILY SKIN & COAT is a daily dental chew packed with a FULL serving of the Missing Link Original Skin & Coat Superfood Supplement. Which means this multi-functional chew contains all the nutritional goodness of Missing Link Skin & Coat combined with BONUS teeth cleaning action and patented Stay-C 50 which supports gum health! INGREDIENTS: Dried Potato Products, Ground Flaxseed (source of Omegas), Water, Vegetable Glycerin, Pork Gelatin, Powdered Cellulose, Pea Fiber, Rice Syrup, L-Ascorbyl-2-Polyphosphate (source of Vitamin C), Soy Lecithin, Calcium Carbonate, Dried Poultry Liver, Salt, Cane Molasses, Dried Kelp, Rice Bran, Primary Dried Yeast, Ground Dehulled Sunflower Seed, Natural Smoke Flavor, Dehydrated Alfalfa Meal, Dried Carrot, Potassium Sorbate (a preservative), Parsley, Dried Fish Solubles, Ground Barley Grass, Freeze Dried Oyster, Zinc Methionine Complex, Selenium Yeast, Pyridoxine Hydrochloride (source of Vitamin B6), Taurine, Yucca Schidigera Extract. 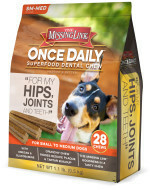 MISSING LINK ONCE DAILY HIP & JOINT is a daily dental chew packed with a FULL serving of the Missing Link Original Hip & Joint Superfood Supplement. Which means this multi-functional chew contains all the nutritional goodness and support of Missing Link Hip & Joint combined with BONUS teeth cleaning action and patented Stay-C 50 which supports gum health! INGREDIENTS: Dried Potato Products, Ground Flaxseed (source of Omegas), Water, Vegetable Glycerin, Pork Gelatin, Powdered Cellulose, Pea Fiber, Rice Syrup, L-Ascorbyl-2-Polyphosphate (source of Vitamin C), Soy Lecithin, Calcium Carbonate, Dried Poultry Liver, Salt, Cane Molasses, Glucosamine Hydrochloride, Dried Kelp, Rice Bran, Primary Dried Yeast, Ground Dehulled Sunflower Seed, Natural Smoke Flavor, Dehydrated Alfalfa Meal, Dried Carrot, Potassium Sorbate (a preservative), Parsley, Dried Fish Solubles, Ground Ingredients: Barley Grass, Freeze Dried Oyster, Zinc Methionine Complex, Selenium Yeast, Pyridoxine Hydrochloride (source of Vitamin B6), Taurine, Yucca Schidigera Extract. The Missing Link Pet Kelp limited-ingredient, organic, kelp based supplements offer many health & wellness benefits. Veterinarian formulated, Missing Link supplements use only the best and most effective natural ingredients. 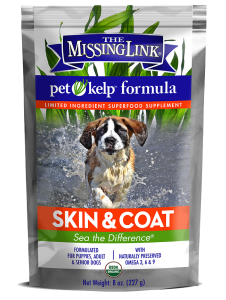 MISSING LINK PET KELP SKIN & COAT is a daily food supplement that maintains your pet’s skin & coat health from the inside out. Providing essential nutrition including Omega 3, 6 & 9 fatty acids, vitamins, minerals and micro-nutrients. Each Missing Link recipe supports the immune system, boosts muscle & tendon function, sustains energy and promotes overall health & happiness. 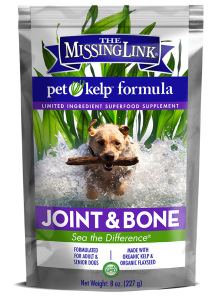 MISSING LINK PET KELP JOINT & BONE is a daily food supplement that maintains your pet’s joint & bone health. 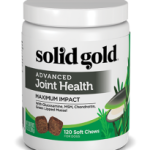 Providing essential nutrition including Omega 3, 6 & 9 fatty acids, vitamins, minerals and micro-nutrients plus a dose of glucosamine for joint support. Each Missing Link recipe supports the immune system, boosts muscle & tendon function, sustains energy and promotes overall health & happiness. INGREDIENTS: Organic Dried Kelp, Organic Flaxseed (source of omega fatty acids), Glucosamine Hydrocholride. 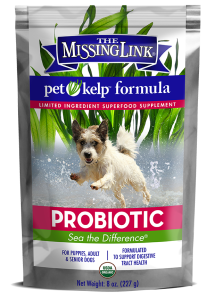 MISSING LINK PET KELP PROBIOTIC is a daily food supplement that supports your pet’s immune system and digestive health. Providing essential nutrition including Omega 3, 6 & 9 fatty acids, vitamins, minerals and micro-nutrients plus a dose of Lactobacillus Acidophilus & organic pumpkin for digestion. Each Missing Link recipe supports the immune system, boosts muscle & tendon function, sustains energy and promotes overall health & happiness. INGREDIENTS: Organic Dried Kelp, Organic Flaxseed (source of omega fatty acids), Organic Dried Pumpkin, Dried Lactobacillus Acidophilus fermentation product. 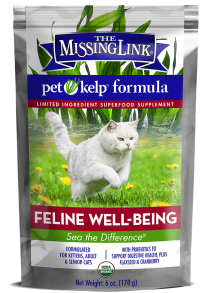 MISSING LINK PET KELP FELINE WELLBEING is a daily food supplement that supports your cats over-all well-being. Providing essential nutrition including Omega 3, 6 & 9 fatty acids, vitamins, minerals and micro-nutrients plus a dose of probiotics & organic cranberry for antioxidants. Each Missing Link recipe supports the immune system, boosts muscle & tendon function, sustains energy and promotes overall health & happiness. INGREDIENTS: Organic Dried Kelp, Organic Flaxseed (source of omega fatty acids), Organic Cranberry, Dried Lactobacillus Acidophilus fermentation product, Dried Lactobacillus Casei fermentation product, Dried Lactobacillus Plantarum fermentation product, Dried Enterococcus Faecium fermentation product. Ask For The Missing Link at your favorite Northland Retailer.